Even with an upset on Monday night, the Miami Dolphins (3-3) aren't going to catch the New England Patriots (6-0) for the AFC East title. The Pats are going to take the East for the seventh straight season barring a Tom Brady injury. But this game would be huge for Miami's potential wild-card chances, not to mention burgeoning confidence. The team looked like it didn't care a lick under Coach Joe Philbin, so he was fired after a listless Week 4 loss against the New York Jets in London. No one thought interim coach Dan Campbell had any chance at the full-time job, but the Fins have won two straight under him in impressive fashion and have been noticeably more intense and better in every facet of the game. Currently Miami is eighth in the AFC but even in the loss column with Pittsburgh (4-3), which holds the final wild-card spot. The Jets (4-2) hold the other. This does start a very tough stretch for Miami , however. Next four games are: at Buffalo (off a bye week and likely to get key players such as QB Tyrod Taylor, WR Sammy Watkins and DT Kyle Williams back), at Philadelphia, vs. Dallas (Tony Romo's projected return) and at the Jets. If the Fins can get through this Pats game and those four after at 3-2, then Campbell might get the job and the Dolphins in the playoffs because four of Miami's last five are at home and the one road game is at disappointing San Diego. I'm not fully on the Miami bandwagon yet. The two wins under Campbell are 38-10 at a bad Tennessee team in Week 6 and then that 44-26 blowout of Houston last week -- I previewed that game here at Doc's and recommended Miami giving the points, so an easy cover. Ryan Tannehill had the game of his career against the Texans, completing 18 of 19 for 282 yards with four touchdowns (three of 50 yards or more; first QB in 15 seasons with that many), no picks and a perfect rating of 158.3. His completion percentage of 94.7 was the best in NFL history for any QB who also had four TD passes. Only Tannehill's last pass was incomplete, and he set an NFL record with 25 straight completions going back to the Titans win. Tannehill has spent much more time under center the past two games, whereas Philbin had him in the shotgun more often. Another thing Campbell is stressing is using running back Lamar Miller more. He was a monster against the Texans with a 54-yard touchdown reception and an 85-yard TD run - both in the second quarter. He joined Chris Johnson (September 20, 2009, while with Titans) as the only players in NFL history with an 85+ yard touchdown run and 50+ yard TD catch in a single game. Miller averaged just 9.3 carries and 32.8 rushing yards in the team's first four games. The past two, it's 16.5 rushes per game for 144.0 yards per game. Tannehill is finding more success on play-action passes because of Miller in the past two games. The Miami defense also looks different after dumping coordinator Kevin Coyle shortly after Philbin. Under Coyle, the Fins allowed an average of 25.3 points, 399.5 total yards and 160.5 rushing yards per game with only one sack. New coordinator Lou Anarumo has simplified the scheme. End Cameron Wake sure has liked the move as he has six sacks and four forced fumbles the past two games. Even the disappointing Ndamukong Suh has played better. Again, though, consider the competition. What more can you say about the Patriots? They continue to lead the NFL by a mile in scoring at 35.5 points per game. New England has scored at least 30 in five straight games, the team's longest such streak since 2011 (six in a row). Last week against the NFL's top defense in the Jets, Brady was magnificent again, completing 34-for-54 for 355 yards with two touchdowns and no interceptions. Brady became the fifth player in league history to reach 55,000 career passing yards. These teams split last year. In Week 1, Miami pulled a 33-20 home upset, outscoring the Patriots 23-0 after intermission and outgaining them 222-67. The last time the Patriots were outscored by 23 points or more in the second half was Nov. 30, 2008, against Pittsburgh. Brady threw for 249 yards and a TD (but on a whopping 56 attempts). Rob Gronkowski had a TD among his four catches for 40 yards. 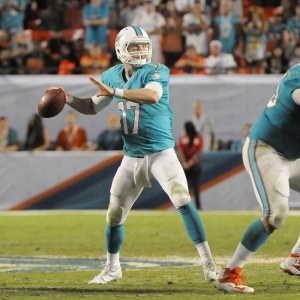 Tannehill threw for 178 yards with two TDs and a pick. In Week 15 in New England, the Pats rolled 41-13 to clinch the AFC East. Brady was 21-for-35 for 287 yards, two scores and a pick. Gronk had another TD catch. Tannehill threw for 346 but was picked off twice and sacked four times. At 5Dimes , New England is a 9.5-point favorite (+105) with a total of 51. The Pats are -370 on the moneyline and Dolphins +310. On the alternate lines, the Patriots are -10.5 (+125), -10 (+115), -9 (+100), -8.5 (-105) and -8 (-110). You can go all the way down to -5 as of this writing. Miami is 3-3 against the spread (2-1 on road) and 4-2 "over/under" (2-1 on road) New England is 3-2-1 ATS (1-1-1 at home) and 4-2 O/U (2-1 at home). The Fins are 5-2 ATS in their past seven on Thursday. They are 2-7 ATS in their past nine vs. the AFC and 0-5 ATS in the past five against the AFC East. The Pats have covered 14 of their past 21 at home. The over is 6-1 in Miami's past seven vs. the AFC. The over is 6-1 in New England' s past seven in October. The home team is 6-0 ATS in the past six meetings. New England sometimes struggles in the heat of south Florida but is 11-2 all-time at Gillette Stadium against Miami. Brady has won his past eight Thursday night games, passing for 2,249 yards and 20 scores in those. But I think this Miami team believes it can win, while the Pats are coming off a rivalry game vs. the Jets and might be a bit sluggish. I'll take the 10.5 points on the alternate line. Go over the total. Patriots win something like 30-24. New to Doc's Sports? We'd like to offer you $60 of free, no obligation picks. Try us out. See why experience matters, and why we have been around for so long while others have come and gone. Click here to sign up today. Also, get three handicappers for the price of one when you sign up for a full-season football package! Click Here for details.